Waverly, Kieran, and Seth are the three main characters. The author switches between each them throughout the book. Each character goes through a tremendous amount of stressful change, and if we didn’t see their thoughts, didn’t see how things were happening through their eyes, I probably would have hated all three characters. But instead, the author makes you torn. You could see their thoughts, know why they did the things that were driving you crazy. It made it hard to hate them, and hard to love them. This author writes totally different than anything I am used to reading. The layout of her books, her writing style and how she uses multiple POVs and third person together to show everything that is going on…..it’s all just different. Not bad, not necessarily good either. But she does it well, and it works. Again, I don’t think these books are similar to much in the way that the story unfolds, or the details of their lives and settings. 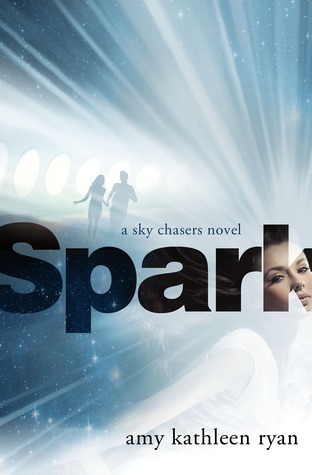 But it is a story about space travel, and in the midst of everything else, it is about a girl torn between two boys. Between Earth and New Earth, in space, and on the Empyrean and New Horizon space ships. These ships are huge. I don’t think she really explains that well enough. They house rivers, rain forests, fields that are harvested by multiple combines, housing units, observatories, sewage plants…….etc. These ships are ginormous. In the future when Earth is a dying planet, caused by people and other unknown reasons. Ok, well first off…that is not how you end a book. How am I going to remember everything that happened and the intensity of the ending without re-reading it again next summer? *GAH* An epilogue would have been nice, haha. But I totally get it. Only…if there are going to be more than three books, I don’t know if I want to read the next one as soon as it comes out. I hate waiting! This book, like Glow, was non-stop. It wasn’t like it was all action, it’s just that event after event occurred. Somehow it remained cerebral as you got inside the three main characters’ heads. Like I said, it made it hard to love them, and hard to hate them. But it gives a great understanding into their minds and helps the reader remember that they are only teenagers, and they are in a traumatic and stressful situation, dealing with it as best they can. In a way, these books remind me of the classic book “Lord of the Flies” by William Golding. Basically, I liked it. A lot better than Glow, once I got into it. And I would recommend it. I’m still on the fence with whether or not to buy it. I probably will if there are more than three books, because I love a good series. But if not, I’ll just have to wait and see how the story ends! COVER REVIEW: I have to say, I liked the black cover of Glow so much, and now Spark and Glow have matching covers and I think they are not as great. They don’t make me want to own this series just because of the art. That’s really too bad. A series written about space and a gorgeous nebula, the Milky Way in their view, a vast amount of stars, and two huge spaceships? And all we get is the silhouette of two people running and the title in a large chunky font. Blah. Don’t even get me started on the girl posing seductively.